Lynn Russell Chadwick was born in 24 November 1914 in Barnes in London. Chadwick’s father was an engineer, and his mother had a passion for the arts, with the Scottish sculptor Thomas Clapperton a member of her friendship circle. As a student at the Merchant Taylors School, London, geometry was a subject that engaged Chadwick, he also enjoyed languages and was a keen sportsman. Whilst at school, his early introduction to art came when he received instruction from an Associate of the Royal College of Art in the technique of watercolour painting. Some of these early works survive, and demonstrate that he had a good command of this medium. Chadwick showed early interest in initially pursuing a career in art, but, faced with the economic depression in the 1930s, he chose architecture as a vocation, seeking a more stable income. He entered the offices of architects Donald Hamilton to work as an assistant draughtsman in 1933. His work included designing shop fronts and plans for buildings, which enabled him to develop a significant level of precision as required for structural design. He moved to other firms over the next few years, gaining a variety of skills in draughtsmanship. 1939 saw the beginning of World War II and Chadwick chose to become a farm labourer to support the war effort at home, although he later joined the Fleet Air Arm of the Royal Navy, training as a pilot in 1941. Following demobilisation in 1944, Chadwick settled into the Chelsea area of London and returned to the architects’ offices of Rodney Thomas, a previous employer. Work for architects was focused mainly on reparation and particularly rehousing the displaced population following the building destruction during the conflict. He began working on drawings for parts of the interiors of prefabricated homes; a type of dwelling designed to provide a fast, simple solution to the chronic housing shortage at the end of the war. At this point, Chadwick began to fashion himself as a designer, with the aim of being free-lance. He entered and won a competition to design textiles for fashion designers Zika and Lida Ascher in 1946, whose other collaborations include textiles designed by artists such as Picasso, Moore, Matisse and Derain. The prize gave him the courage to produce more designs, and an entire notebook from 1946 survives. These motifs are spirit-like forms, painted using a bright, bold colour palette. Chadwick’s previous employer, Rodney Thomas, was able to provide the starting point for the artist’s career as a sculptor. Thomas himself was producing balanced forms with cantilevers, and in 1946 Chadwick began experimenting with mobiles made from balsa wood and wire. These lightweight forms would react to any air flow. The mobiles were invented primarily to attract visitors to exhibition stands, which Chadwick was designing for various trade fairs. However these delicate structures also drew the attention of art dealers, and Peter Gimpel of Gimpel Fils, London, gave Chadwick his first one man show in 1950. His early mobiles were light, delicate and quite small in size, however scaling up this type of work proved to be problematic. He needed to find a suitable material that would allow him to create these mobiles on a larger scale. To address this challenge, Chadwick took a course in welding, enabling him to produce sturdy metal structures. As a sculptor, Chadwick did the majority of the physical work himself, until he began working with sheets of steel later in his career, at which point he employed assistants to help. Chadwick saw himself as a ‘constructor’ rather than a carver or a modeller. He would build a skeletal frame on to which he would attach a skin, or surface, from metal. Patina, or surface colour, would be added later. This method is in contrast to the traditional process, of creating a small model, and scaling up. He rarely produced detailed sketches beforehand and preferred to work in a more immediate manner, improvising as the work unfolded. This essentially heuristic approach was central to Chadwick’s method of working.2 Many drawings were produced post-production, as a way of recording his work, and also to satisfy the demand from dealers and collectors. (1901 – 1966) to win the International Prize for Sculpture – a win which was a surprise to the artist and a significant accolade. The Jubilee series of works was conceived in 1977 however the single figures and figure groups that are characteristic of the artist’s later work have their foundation in ideas developed during the 1950s, seen in such works as The Stranger (1954). 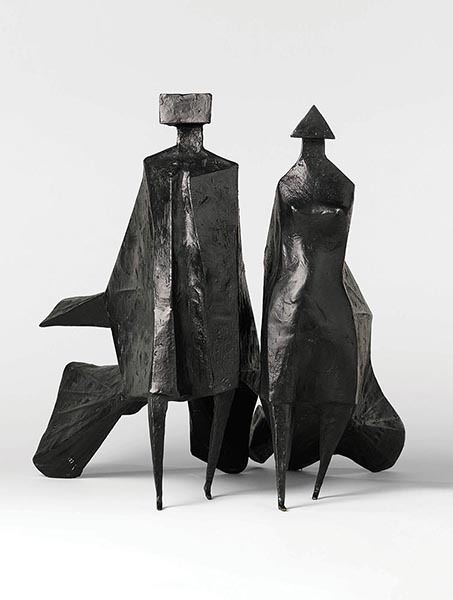 Chadwick began developing his figurative sculptures into a series of diamond shapes - walking figures with their cloaks billowing behind them, providing Chadwick with a theme capable of sustaining endless variations.3 The addition of clothing was not simply surface drapery to add texture; the apparel was of considerable significance, effecting visual gravitas, as well as much-needed structural support. Chadwick created figures in a variety of poses; some sitting, standing, or walking, also couples and trios. In later years, he added integral steps and blocks into his work. The Jubilee series of which there are several pieces of varying scale, shows two figures walking in unison, exuding a confidence and power in their stride. The paralleled movements and gaze of the figures unites them, portraying a certain level of synchronicity. Chadwick died in 2003, during the final stages of planning an exhibition of his work at Tate Britain. - a belated tribute to one of Britain’s greatest sculptors of the second half of the twentieth century.4 The artist was awarded Commander of the British Empire (CBE) in 1964 and a French Officier de l’Ordre des Arts et des Lettres in 1985. His works are held in most major international art collections including MOMA New York, Tate Gallery London, The British Council, Israel Museum, Tel Aviv, Fine Arts Museum, Belgium, amongst others. His family home at Lypiatt Park, Gloucestershire, has seen part of the grounds transformed into a sculpture park, providing a magnificent setting for his work.